I thought at first it must be a phoebe – they regularly nest next door – but it was too big. It had a black bill, a black eye, and a light grey head, but what was interesting was the neck and breast. The neck was also a light grey, but the grey also came down a little onto the upper chest which was a pale yellow. That really surprised me. The grey almost seemed like a watercolour wash as it faded into the yellow – there was no distinct line between the grey and the pale yellow. The bird’s stance was upright as it perched on a tree branch, with a longish tail. Unfortunately I didn’t get a good view of the tail as it flew off, so I can’t say if it had the distinct white edging on the tail feathers. From what little I’ve read – I still prefer books to checking online! – this bird occasionally makes it way eastward from its regular territory. Can you confirm than anyone else has seen this bird? I don’t think I’m dreaming! Note: On August 26, 2013, Dave Milson saw a Western Kingbird in his backyard on Scollard Drive in Peterborough. The bird was gone the next morning, however. 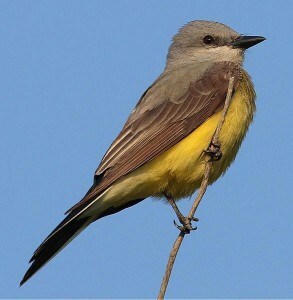 As far as I know, Stephenie’s is the only sighting this summer of a Western Kingbird in our area.